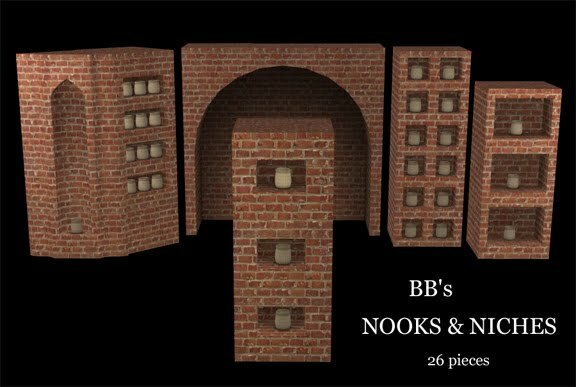 I guess this is a build/buy set of 26 modular pieces of niches, nooks, alcoves and arches that you can mix and match for every room of the house and garden. 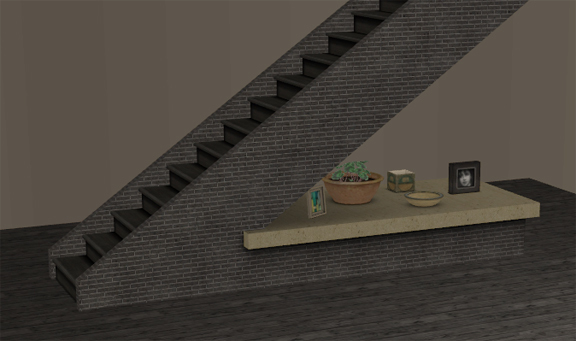 All niches have deco slots and the understair pieces will fit snuggly under the stairs with no cheats. Most pieces go down with the walls when playing. 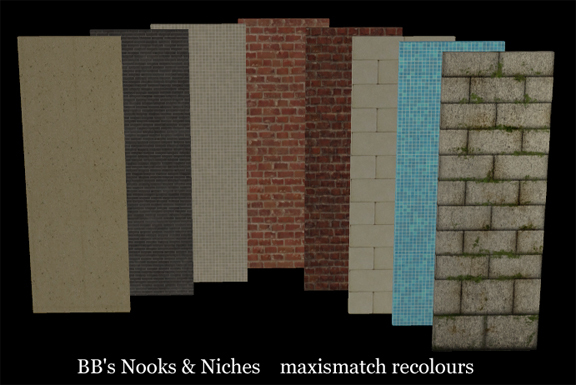 Best of all there is only ONE master mesh designed to use any seamless wall type texture, so very easy to recolour. I suggest that you use the collection file included and above all have fun as the possibilities are many. Part Three for the garden can be found here. Nat, what a fantastic set, it looks terrific, can't wait to play with it, love and big hugs, judith. Oh wow Nat, this is ... perfect. Thank you so much. This is just incredible, Nat!!! Thank you for these.......they will be used a lot! Oh, this is just what I´ve always wanted for my game - I just haven´t realised it until now. Simply terrific! I loves.....alot. You are making my inner hoarder come out. Thank you very much. This is absolutely brilliant!! Thanks for creating this great set! Wow, this is really awesome! Thank you, I love all of your creations! Fabulous! Thank you so much. I am sure these will get a lot of use in my game. Thanks again BB. Omgosh, these are fantastic. :D Thank you! Holy frack this is awesome. Holy Hell! What an awesome idea! Thank you so so so much for sharing. I can't wait to check these out in game! Wow! Thank you so much for sharing this. All your meshes are so wonderful. Decorating for Sims2 would not be the same without your creations. Ideas! Ideas! Ideas! are already popping into my mind!. These are wonderful. I can't wait to start using them! Have I told you I love you lately, BB? Looking forward to playing with this set really soon! Hey! That seems to be a very unoriginal thing to say but I LOVE YOU! :D Thank you so very much for all these things!!! Fabulous set Nat!! Wow, huge thank you for sharing your talent with us! I'm speechless Natalie, this set is awesome!! You never stop to amaze me with your talent! Thank so much for share all your woderful creations with us!! WOW, another "must have" set from you...thank you so much!! Thank you all very much. I am so happy that you like it as I was very excited making it. I can't believe how great and useful this is! Thank you so very much, great work!! What a wonderful and extremely useful set!! I have been wanting something like this for a very long time. Thank you so much for making and sharing this. This is a truly fantastic set...i cant wait to use it! Thank you so much! Very nice! Must-haves for sure!! WOW Nat, what a gorgeous set, thanks so much! Natalie, your work is always welcome in my game. You make such beautiful and practical creations. Lovely, as always. Thanks so much! natalie, you just keep on showering us with all these wonderful creations. You know you're fantastic, right?! Thank you so much!! *SQUEAL* I know we all can't wait!! These are wonderful!! What a fantastic idea. Thank you for being so talented! AMAZING work!!!!! Going to go into the game and build a new house now! Wow ! Thankyou for this original and beautiful creation. 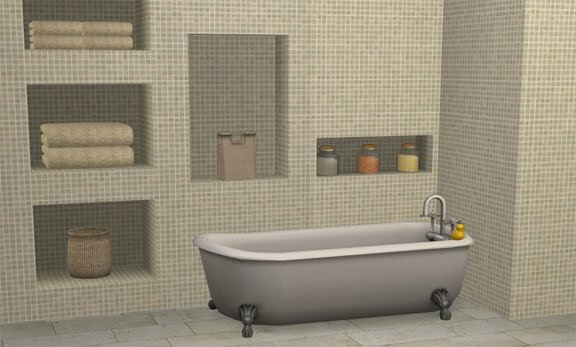 Just visiting your blog for the first time in a long time and I'm so happy to see you're still creating for TS2! You're one of my favourite creators ever and I use your objects in almost every single lot, so it's makes me very happy to download new stuff from you. Thank you so much! These arches are the perfect backdrop for the effigies of baal my simulated buggers like to worship. Thank you! These are brilliant! I was wondering though, could you tell us which wallpapers match, so I can add them to the collection file? I'm having a heck of a time finding the correct matching wallpaper among the hundreds of custom ones I have. 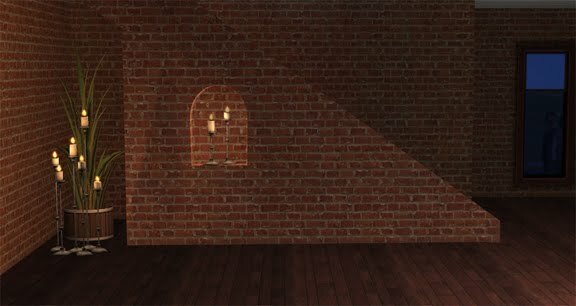 I don't know what the walls are called in game as I just extracted what I liked directly from SimPe and used the texture names to name the package files. If I can find them I will see about adding them to the next collection file. That you, that would be fab. This is a great set, very versatile! Not only for inside but also possibly for more interesting building faces. Thank you! Well, I haven't ever made anything game crashing before but there is always a first time. This set was extensively tested by me as well as other people and has been around for a good three weeks with no apparent problems. Could it be that you downloaded something else at the same time or have simply reached the limit of how many downloads your pc can handle? Thank you soooo much, this is beyond awesome! OH GOSH! We reeeaaally need this in Sims 3 also! I've fawlen for youw!! Love your work! I love your stuff, I've downloaded everything you've published here, followed you over from MTS. I want to ask you about Niche 3, though. I can't seem to be able to put things on the top shelf. Is that intentional, or is it just my game? I've been using 'M' to navigate between them, and the middle and lowest one work, but the top one doesn't. I made alot of niches and alot of slots and it was very confusing. I doubt that it was intentional but try not using M and filling the slots manually by hovering the object just in front. It worked for me so it prolly works for you too. These are just brilliant! 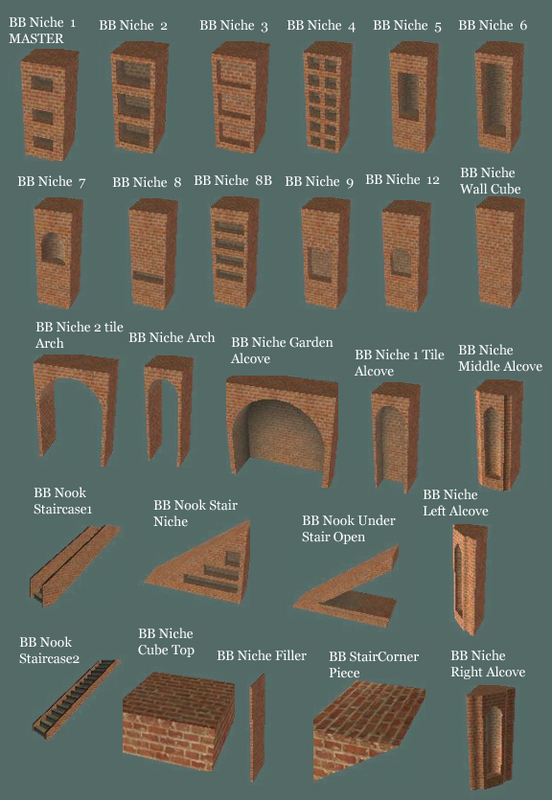 Please would you consider converting these for The Sims 3? This set, oh wow! Finally something that will really improve our/my homes. I cannot wait to use these. Much love for your downloads! Please, for the sake of the Sims community's sanity, please at least ALLOW someone to convert these for the Sims 3! omgosh I just love these sets..got all 3 of them plus the extra one..thank you so much.. I agree. I have been trying all day. I really need this set. Please help. I've noticed that other Box downloads on other sites aren't downloading, either. They must be having issues. Hopefully, it will be resolved within a few days. Here is the Box.com website: http://www.isitdownrightnow.com/box.com.html. Other folks are also experiencing problems. Yup....waited to download until the 1st. Thought the problem was a bandwidth issue for all of last month. The download seems to be broken. Is there another option? Like Mediafire? For real....is there no option #2? I can help. I hope you get this message. Go to http://www.modthesims.info/download.php?=560590. That should take you to the creator Droopsi. She has done beautiful recolors. On the download page it has buggybooz's nooks and niches download. For all 3 files. I had to extract the file to show that all 3 were there. Good luck. Thank you for trying to help us but Droopsi's recolors link back to this page (which they are supposed to per Buggy's TOU). I have been reading all the comments in the Christmas in July 2015 event on Garden of Shadows. It seems folks are having a problem with their Box bandwidth resetting properly at the beginning of the month. Some have even had to ask for it to be done manually. One person said they had to wait more than 4 days. I hope this will resolve on its own without Buggy having to ask them to do it manually. I hate posting as Anon but I don't have a Blogspot account. http://chii.modthesims.info/getfile.php?file=1555005. This is the link I saved. I hope it works. It's on Mod The Sims. You must be a member. Under Droopsi (Project " Sims- Santorini" Part 7 Set White City. There are 9 files. Click on tab to download. Buggybooz is last one. Droopsi let me know that there have been issues downloading here. So she made the download available on that page. Please let me know if it works for you. It did for me. Thank you! I guess this was on MTS. Hmmm I would have thought there would have been more files. Oh well thanks for all your help everyone! And of course to Buggy for making awesome things! hello, this looks amazing but i think the download link is broken, is there any way you could link us to an alternate download? thank you very much for your hard work! Many years later I finally find my way over here and luckily the link still works! Thank you so much for these!